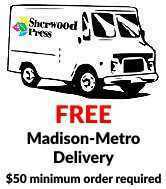 Sherwood Press offers quick, quality printing. Even better for tight budgets, our one & two-color presses get the job done, often with the same impact as full-color prints. if it can be printed, we can make it happen! Contact us or call today for all your quality printing needs. Sherwood Press is environmentally conscious, using soy-based inks, post-consumer recycled papers, and recycling our printing waste products. © 2012 - 2019 Sherwood Press - A Division of Heavy Duty Inc., All rights reserved. Page Summary: Sherwood Press offers offset printing, label printing, business card printing, brochure printing, printing envelopes, printing posters, quality printing, printing flyers, printing booklets, menu printing in Madison, Sun Prairie, Monona, Windsor, Waunakee, McFarland, De Forest, Fitchburg, Cottage Grove, Oregon and surrounding Dane County communities.